Our cancellation policy requires a 30 day notice from the time of arrival. Upon the proper 30 day notice we will refund your deposit less a $20 processing fee. Cancellations given with less than 30 day’s notice will forfeit their deposit unless the cabin is re-rented for the same time frame at which time we will refund your deposit less a $20 processing fee.We allow one date change per reservation as long as the change in date is requested at least one week prior to arrival and the new date falls within the same calendar year. Last minute date changes are treated just like a cancellation and a new deposit will be required. All reservations require a 50%deposit at the time of reservation with the balance due at check in. Reserving guest must be 25 years ofage or older and present a valid photo ID at check in. Each cabin has a maximum occupancyallowed by fire code. Therefore house parties are strictly prohibited. Anyguest found hosting a house party will be asked to leave immediately and norefund will be issued. We offer two pet friendly cabins, 1one bedroom and 1 two bedroom. Guest must request a pet friendly unit at thetime of reservation. In order to accommodate guests with allergies we mustcharge a fee of $100 to any guest bringing a pet into a non-pet unit. All of our units are nonsmoking. Ashcans are provided outside for your convenience. A $100 fee will be charged toany guest who breaks the nonsmoking requirement. Our cancellation policy requires a30 day notice from the time of arrival. Upon the proper 30 day notice we willrefund your deposit less a $20 processing fee. Cancellations given with lessthan 30 day’s notice will forfeit their deposit unless the cabin is re-rentedfor the same time frame at which time we will refund your deposit less a $20processing fee. We allow one date change perreservation as long as the change in date is requested at least one week priorto arrival and the new date falls within the same calendar year. Last minutedate changes are treated just like a cancellation and a new deposit will berequired. Requests for a particular cabin willbe honored whenever possible, but cannot be guaranteed. We strive to provide an enjoyablegetaway for our guests. Noise complaints will be taken seriously and a warningwill be issued. A repeated offense will require the guest to vacate thepremises and a refund will not be issued. A two-night minimum is required forall weekend stays. Holidays include Martin Luther KingWeekend, Presidents Day Weekend, Memorial Day Weekend, Fourth of July Weekend,Labor Day Weekend, Columbus Day Weekend, and the middle of December through thefirst of January. A three-night minimum is required for all holiday weekends. WE THANK YOU IN ADVANCE FOR YOUR COOPERATION WITH THEABOVE LISTED POLICIES. MAKING A RESERVATION CONFIRMS YOUR ACCEPTANCE OF THESEPOLICIES. IF YOU HAVE ANY QUESTIONS REGARDING ANY OF THESE POLICIES PLEASE FEELFREE TO CALL OR EMAIL THE OFFICE. Our beautiful luxury log cabin and treehouse rentals are the perfect place for a short romantic getaway, business trip, or extended WV Vacation and are a unique alternative to traditional lodging options. 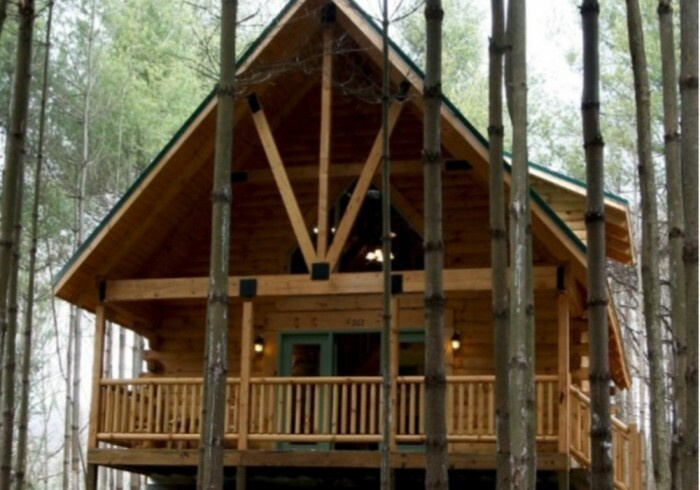 We offer treehouses, 1,2, and 3 bedroom cabins, and a four bedroom lodge and conference facility. With our beautiful views and fun on-site activities we are the perfect place to host a family reunion or just get together and spend time with close friends. Our spacious lodge with outdoor gazebo offers a wonderful indoor or outdoor wedding venue and can be used for birthday or anniversary parties, baby or wedding showers, company retreats and much more. We are very conveniently located only 1 mile off I-64 and 5 miles off I-77, just south of Beckley, in Raleigh County WV. Gas, groceries, and restaurants are located less than 5 mins from the cabins. Shopping, movie theatre, extended dining options, and much more are less than 15 minute drive away. We are centrally located near some of Southern WV’s most popular skiing, white water rafting, ATV riding, and golfing destinations. We can help you build a complete WV Vacation including many outdoor adventures in our Outdoor Adventure Vacation Packages. See Nearby Attractions for a complete listing of local activities. Call us for complete details and to book your custom WV Vacation.